According to the old Polish tradition, Andrzejki (a party on St. Andrew’s eve, Nov 30) was the last party of the year, with some special customs such as divining future from pouring hot wax on water. (Wax pouring is not planned this year). Live music by the Polonus band from Portland. The restaurant and bar will be open at 7 pm. You need to be 21+ to attend. The Polish Home is closed on November 24, 2006. The Seattle Polish American Parish celebrates the Annual Feast Day of St. Margaret on Sunday, Nov 19, 2006. Celebration will start with High Mass at 12:00 noon with the presence of auxiliary bishop Joseph J. Tyson. After the mass a dinner will be available in the Parish Hall. The artistic program includes Marzena Szlaga playing on piano and performance by the children group. As at any traditional church feast, you will be able to obtain devotional items such as rosaries and prayer books. Do you enjoy more parking spaces at the Polish Home? It’s your money at work! Come to discuss and support more changes at the Polish Home! This is an open monthly meeting, everybody interested in the project is invited to come and discuss issues. Volunteers are also welcomed to the meeting! Marek Wencel is a local mountaineer whose passion for peaks in Himalayas, Andes and other high ranges goes together with passion for high level photography. After scoring awards in recent competitions by National Geographic and Nikon, his photographs are on display at two café Zoka locations in Seattle: at Green Lake and the University Village. You can also buy his 2007 mountaineering calendar at the Green Lake Zoka or at his website. Poland regained its independence on Nov 11, 1918, when Jozef Pilsudski became the Head of State after a popular revolt at the Polish territories led to a formation of the reborn state. This year, the 25th anniversary of imposing the martial law in 1981 and sacrifices by the Solidarity activists will be remembered. The program includes performances by the Polish Choir, the poetry group, children from the Polish School in Seattle and the Polish Scout Troop. The restaurant will be open from 1 pm till after the concert. The Northwest Film Forum invites to a retrospective Revelations of the Human Soul: Works of Krzysztof Kieslowski, devoted entirely to the famous Polish film director. The retrospective features four sets of Kieslowski’s frank documentaries, four full time features: The Scar, Camera Buff, Blind Chance and No End, and two films from the Decalogue series in their theater versions: A Short Film about Killing and A Short Film about Love. Kazimierz Poznanski is an art collector and a painter as well as a professor at the UW Jackson School of International Studies. The Soaring Crane Gallery in Pacific City, OR, displays about 20 of his recent paintings on rice paper, including seven paintings from the Geranium series, nine still lives from the Desire series and several landscapes. If you plan to go to the Polish Festival in Portland, a side trip to Pacific City might be just what you need! The biggest such event around Puget Sound, the Polish fall bazaar features booths with Polish books and CDs, crafts, pottery, crystal, amber and other merchandise as well as booths by local Polish-American organizations. You can also buy Christmas ornaments and wafers (oplatki), Polish pierogi, home made cakes and sweets as well as enjoy a full course The Vivat Musica choir will sing at 2 pm both days. Organized by the Ladies Auxiliary. The book for the meeting is Krol kier znow na wylocie by Hanna Krall, published by Swiat Ksiazki in 2006. 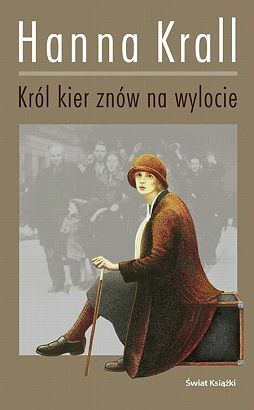 Krall, a writer and a journalist, is very well known for her books on fates of Polish Jews; she was also nominated to 2005 Nike for Wyjatkowo dluga linia (Exceptionally long line). In Krol Kier Krall applies her vintage terse and detached style to an extraordinary story about power of love carrying a woman through the Holocaust. Krall’s books are widely translated and available on the internet. Please see the club website for more details. Joanna Brzostowska is a painter and art teacher based in Warsaw, Poland, where she also runs her own gallery, Galeria Konstancin. Her impressionist art, full of color and light, ranging from figurative representations to large format, abstract images was featured in exhibitions all over Europe as well as in Japan and Canada. The Artist comes to Seattle for the opening night. 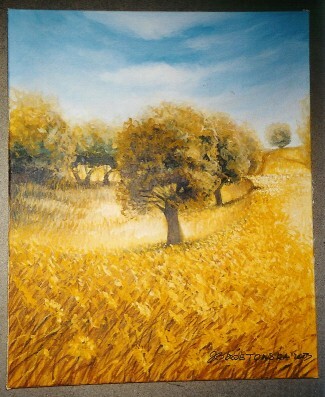 The exhibition, organized by Café Flora and the Artist is available from October 4 till November 7, 2006.